I really like this one! Maybe it’s not the best summertime beer, having a rich, thick, sweet character; however, it is superior in flavor. 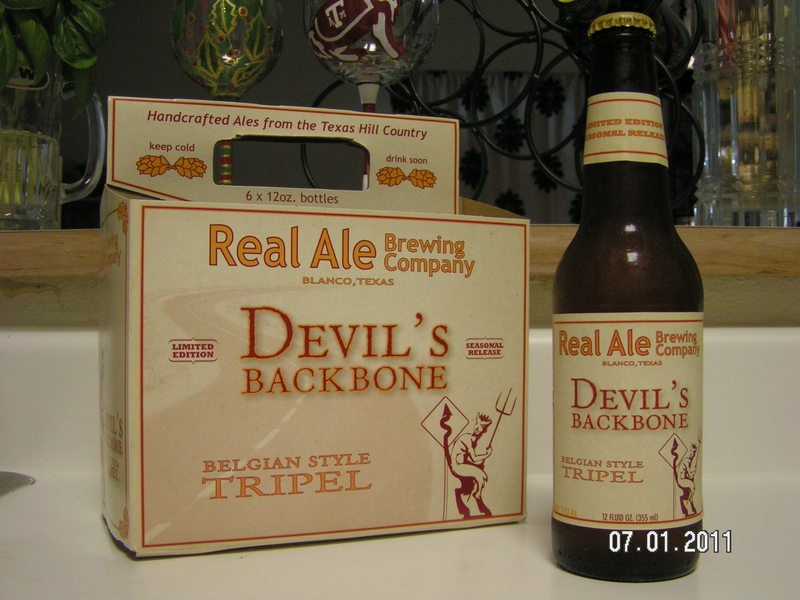 Today, I give you Devil’s Backbone Belgian Style Tripel from the Real Ale Brewing Company in Blanco, Texas. This particular Tripel is named after a scenic ridge that runs between Blanco and Wimberly…Texas that is. In the Hill Country of Texas (near Austin) there are some truly beautiful vistas on two-lane, twisting, winding roads that are prized by bikers (both pedal and motor), and just about anyone else who has the intestinal fortitude or AC to withstand the heat. One of Texas’ most scenic drives, officially R.M. 32, the “Devil’s Backbone” is a winding, razor-backed ridge overlooking Hill Country vistas. The Real Ale Brewing Company, a still smallish microbrewery, arrived on the scene a few years back offering a fine Pale Ale, Brown Ale and interesting Rye Ale. This Tripel is a limited edition, seasonal release. After tasting it, I wondered “Which season is that?”. It really tastes more like a winter ale. Real Ale has combined Czech Saaz hops and Belgian yeast to create a unique flavor and aroma. Candi sugar made at the brewery adds to the authentic Belgian flavor, and brought to mind a vision of Trappist monks, stirring large cauldrons of wort.